I've gone back and forth over writing a birth story for this last time around, mostly because there's not much to write about. Each of the other births was a whirlwind of drama, after which I had quite a bit to write about and this time that just wasn't the case. 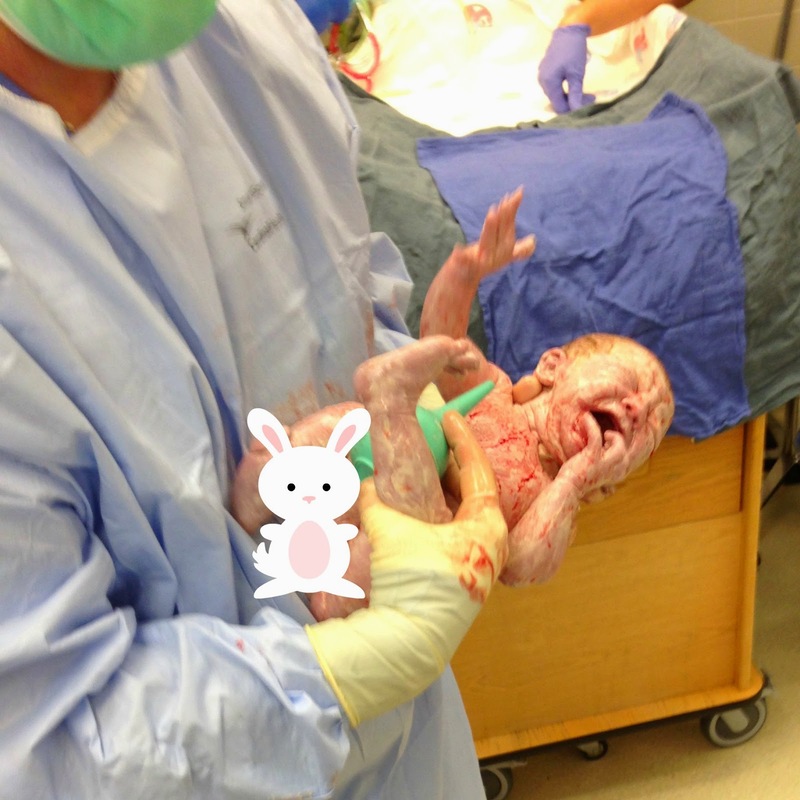 But I thought someone might be interested in reading about a scheduled fourth c-section (or just a scheduled section in general) and since I have all the other birth stories written out I definitely needed to write this one out as well. This was the first time that I didn't go into labor on my own before the big day. In fact, after having months of real contractions, once they got the sinus infection under control a week before the c-section, the contractions finally, mostly stopped (or at least weren't two minutes apart). My doctor thinks, and it seems after having it happen when I was sick with Patch as well, that when I get even a little run down in the third trimester my body starts acting like it's in labor... but having a week off from that before the baby was born was great. I woke up early on the morning of my c-section. I shuffled around the house putting my toiletries into the hospital bag and getting the kids ready for my departure and waited for Nani and Grumpa to arrive to watch them so we could head in to Labor and Delivery. to show my bump! The baby felt gigantic! The night before the scheduled section, Paul and I had gone on one final date night, going to confession and Mass and getting a special blessing from the priest (who told us he happened to be c-section number four for his mom too!) and then going out to dinner and enjoying one of my favorite pregnancy cravings, baked macaroni and cheese with bacon and jalapenos, before realizing that I had forgotten to get my lab work done and rushing to the hospital's 24 hour lab. It was odd, knowing this time around when we woke up that by the end of the day the baby would be there. As we got ready things took longer than I thought they would (as they always do around here) and I ended up rushing to install Patch and Maggie's car seats in my parents' rental ten minutes before we were supposed to be at Labor and Delivery. Thankfully the hospital is only a couple of blocks away, and so we walked in only a few minutes after the scheduled arrival time. We were ushered back to a room in triage where I answered the lengthy hospital intake questioner and posted pictures like the one below on instagram and facebook while Paul napped in the chair next to me, apparently gearing up for a night without sleep, while I asked questions like "how can you sleep right now!!!" Because I couldn't relax... at all. I was excited to meet the baby and nervous about the two things I hate the most... the IV and the epidural. And so I sat thinking about how strange it is to be more worried about the epidural than the major surgery I was facing... and counting epidurals and spinals on my fingers. I'd had six epidurals and two spinals going into the surgery, nine altogether afterwards, and after having a spinal headache I tend to worry more about the epidural than any other part of having the baby. And after having so many IVs go bad (they said because my blood clots fast) during the mystery illness with Patch I was nervous about being poked over and over and over again trying to get something to work. Still meeting baby trumped everything else, so my main thoughts were excitement and nervous anticipation. The first thing we found out, after a quick ultrasound, was that somehow, after being transverse and breech for most of the pregnancy, he was head down (although posterior just like Sadie). Then my doctor came in to see us and I found myself facing the first possible bad news of the day. There was an emergency procedure being done in the OR at the moment and my c-section was scrunched in during the only time slot he had available that day. After my surgery he was supposed to be at a meeting for the re-accreditation of the medical school, and so if the surgery didn't go quickly the on call doctor would have to fill in. Cue fretting. I really, really wanted my doctor to do the section so that he could tell me what kind of shape my uterus was in after the previous three c-sections. Sure he'd have notes that let him know if someone else did it, but since he's likely going to be the one seeing me if we're ever blessed with another baby, then I'd rather he be the one to know how things looked and went in my last surgery. "So, we're doing a tubal today, right? At first I said "Nope, we're not." in my politest voice, but by the end I'll admit exasperation was creeping in and while I said "no!" what I really wanted to say was, "Really? Really? A dozen people and no one knows what surgery we're doing and which one we aren't doing today?" I didn't. But it was disconcerting... until I really wanted to ask if everyone knew we really weren't doing a tubal... and it made me even more glad when my doctor did end up being the one to do the surgery. Finally it was time. I took the horrible tasting medicine that's supposed to keep my stomach from getting upset and walked to the OR with the IV, which actually didn't hurt at all this time, in my arm. It was time for the dreaded epidural... and I was dreading it even more after learning it was a student who would be setting it while the doctor led her, step by step through the process. Thankfully it was actually the least painful epidural I've had, although it did take quite a while to get it in place and my legs were shaking so hard that I was kind of surprised she was able to do so. They laid me back and I waited for the epidural to take effect. And waited. And waited. Did I feel this ice cube on my face? Yes, I did. Did I feel it on my side. Yes, I most definitely did. Did I feel this sharp poking thing on my sternum. Yes, ouch. Did I feel it on my side? Yes. Did it feel like pressure or did it feel sharp? It felt sharp. Quite sharp. Here again, on my sternum? Yes. Ouch. Ouch. Ouch. Yes, that hurts. After a dozen pokes it really does. And I could still feel it on my side. After ten minutes of still feeling being poked with the sharp object, I honestly felt like I was going to hyperventilate. My doctor came in and they told him it was taking a long time for the epidural to take effect. One of the anesthesiologists didn't seem to believe me (or was just grumpy it was taking so long) when I said that I could feel it and I was seriously tired of being stabbed in the sternum over and over again as a means for comparison (by the time I got to delivery there were many tiny little cuts all from being poked so many times). Then it finally took and they started the surgery. 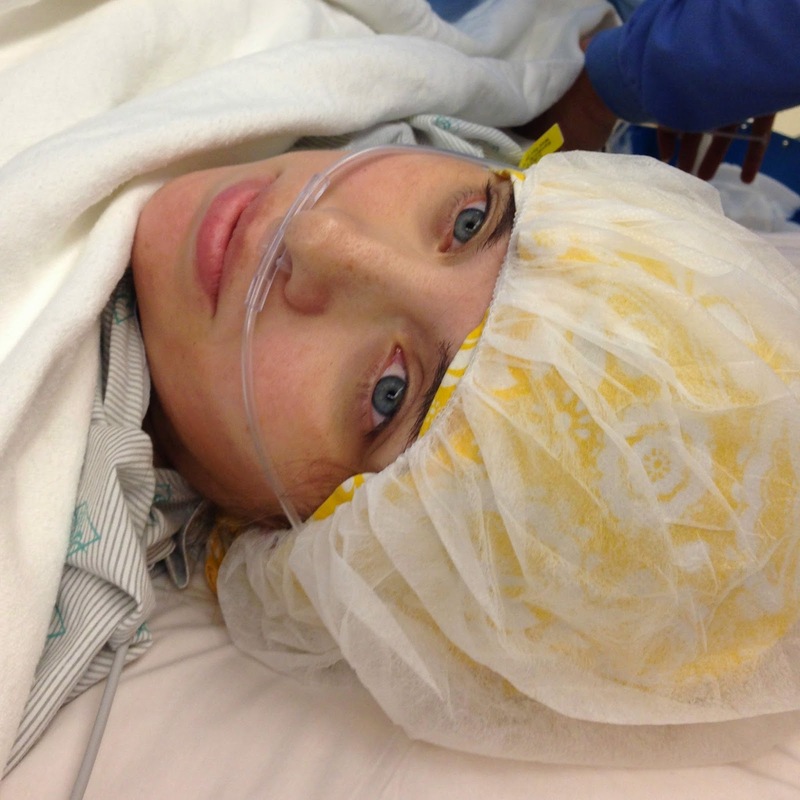 With my previous two c-sections there was a lot of tugging and pulling and pressure. This time didn't seem nearly as bad (or maybe I'm used to it now!). My doctor had told me they were going to cut around the previous scar in my skin, so instead of four there would be only one. And so I laid there and ran my finger up and down the cold metal bar that held up the curtain to distract myself from what I knew was happening on the other side of the sheet, and waited to hear the cry. My doctor told me when he was almost out and then that he was out and I held my breath for a moment and heard that sweet, sweet sound as he started to cry and then saw him come around the side of the curtain, screaming as they checked him and measured him and weighed him. 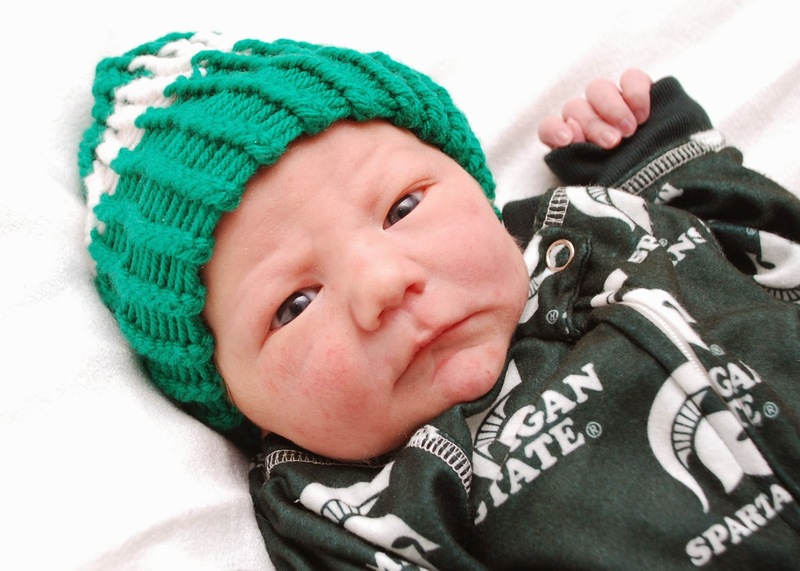 James Ignatius was our littlest baby at 21 inches and 8 lbs 7 ounces. I was shocked. Throughout the pregnancy I'd felt like he was huge. 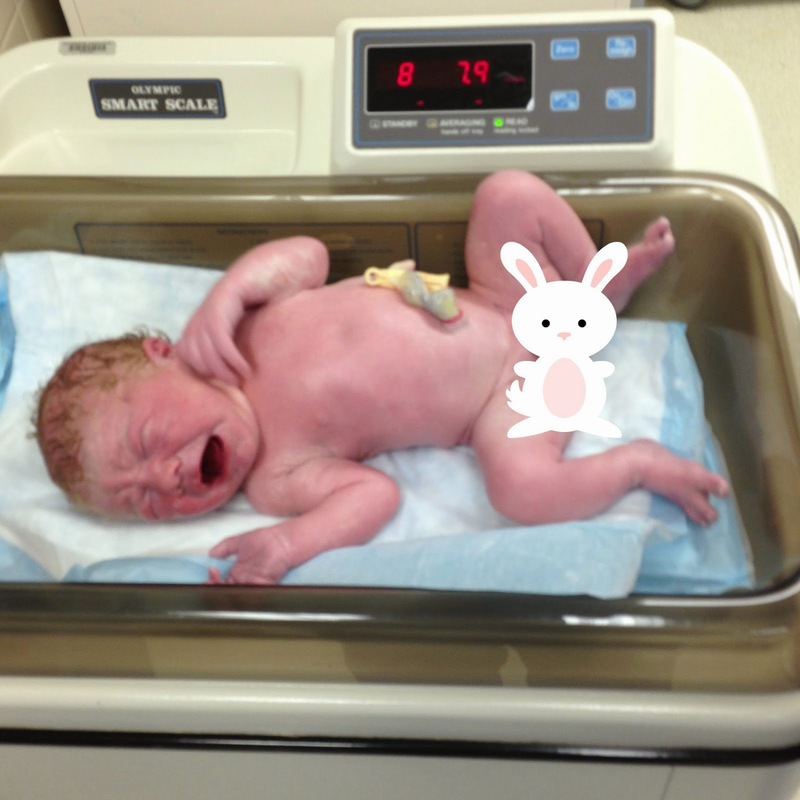 He was healthy and pink and got a 9 on his Apgar score! My doctor told me that my uterus hardly had any scar tissue on it, that there was a tiny bit of thinning starting at the bottom but that things looked good and then they sewed me back up, minus the three previous scars on the outside. Then they handed me the baby, who was never taken from the room, and wheeled us into recovery. I asked to be sat up a bit and began to nurse James, while we discussed whether or not he had red hair. The nurse left, but came back in a few moments later. Did I feel dizzy? Well now that she mentioned it... She said that my blood pressure was low. Oh it always is, I replied, suddenly feeling faint. No, really low. 70 over 30. I needed to lay flat (where I learned that it's really, really hard to nurse while flat and not on your side and not able to feel anything from your ribs on down!). The next four hours were a bit of a roller coaster as my blood pressure would go back up to it's normal low levels and then plunge back to 70 over 30 before going back up, over and over again. It meant I spent quite a bit of time in recovery, waiting for it to stay put. I'd called my parents after the baby was born and while I waited I called again and told them that I didn't think bringing the kids in that day was going to be a good idea. I was just a little too dizzy and weak to think about it just yet. Then it was finally time to go to our room, where I found I would be up and walking in four hours. This, along with keeping the baby in the room after delivery, is one of my favorite things about this particular hospital (okay and the six page menu... I love that menu...). I love that I don't have to stay in bed and get to get up and walk around. They had a schedule on the board saying that I would be up and walking at 9pm, 1 am and 5 am. At 5 am I would be allowed to go out into the halls. I've found that getting up right away is definitely better for me recovery wise and so I was really happy to be up and about so soon. After Maggie I begged to be up and walking for two days after she was born and was repeatedly told no, so I was thrilled that it was the policy to have me up and walking that day. All of our nurses were great, but the first had me smiling from the start, when she asked how many kids we had and then said "I think four is a perfect number! We had four and then we doubled it and then had another one after that!" James and I cuddled and nursed. And after four days we got to go home and get back into the swing of things, this time with a little extra help for the first eleven days after the baby was born, which was amazing. And that is James' birth story! I guess I actually had more to say than I thought when I started writing! I guess I've been lucky that the hospital where mine were born insisted on me getting out of bed four hours after getting to the floor. Unfortunately for the first two, because of how the hospital was set up and before the new women's and children's wing was built, I had to be in recovery by myself and everyone saw and held my babies before I could! With William though, in the new hospital, I was able to nurse him right away and he stayed with me 100% of the time. I only stayed in the mandatory 24 hours though with all mine because I don't like not being at home. It probably all started with Shelby though. The bed was awful and I kept feeling the bar poking into my back! I have that yellow snood! Love it. The baby is the cutest, as always. Congrats! great story! I am amazed at your patience with the tubal question. What an annoyance.